Today I feel a little out of sorts. I have just found out that my dear old cat Brzeska has died. Brzeska having a doze on his favourite spot, the Syrian camel foot stool. My husband and I bought Brzeska from Sheffield Cat Shelter in 2004, although back then Brzeska was called Tommy. I choose him because he was the most stylish and elegant cat I had ever seen; he had sleek black fur; a little bit of white around his nose like a neatly trimmed moustache and a white patch on his chest which made him look as though he were wearing his best bib and tucker. A suave and stylish puss could not be called something as commonplace as Tommy, so I renamed him Brzeska after one of my favourite artists Henri Gaudier-Brzeska, who had incidentally drawn and sculpted some fantastic cat creations. Cat by Henri Gaudier-Brzeska 1913. When I was pregnant with my twins, Brzeska was the most protective cat ever. He hardly left my side and as the bump grew he would curl up around it and snuggle in bed with me. He did the same thing when I was pregnant with my third child. So, when we decided to go to live in Sweden three years ago, we were in a real quandary – did we take the cats or not? 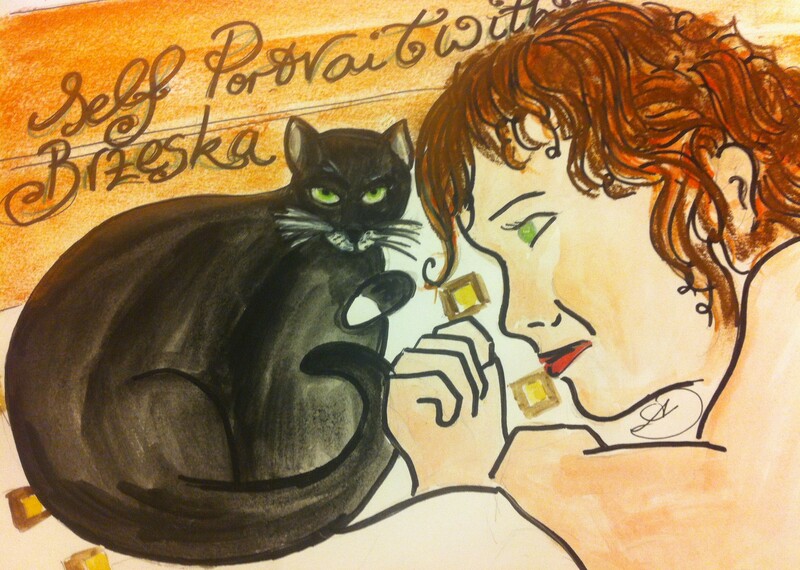 Brzeska and our other cat Moon, were both too old to travel that far, but who would take them both together? Just two weeks before we were due to emigrate, my husband Mark came home and said a lovely woman who worked at his school said she would take them both. Sian gave them both a wonderful home and I always knew they were well loved and were being well looked after. She regularly sent photos of them for me, videos too and when it was my 40th birthday even a photo of Brzeska holding a card. Over the last few months, I have been following Sian’s facebook posts and she is now pregnant, and once again nurse Brzeska has been sat on her tummy and keeping her company while she had morning sickness. And it was on facebook that I read her post about the death of Brzeska, earlier today. One of most important and influential writers in history, cat lover Charles Dickens once said, “What greater gift than the love of a cat?”. 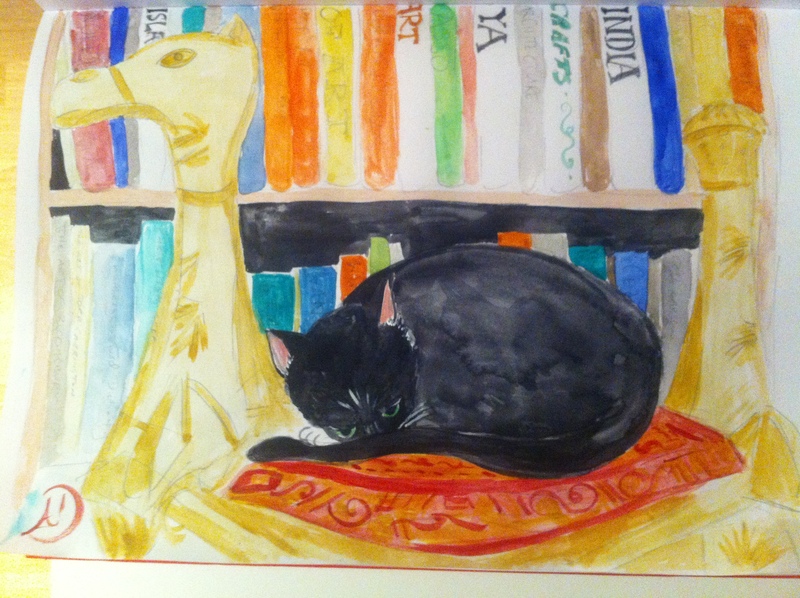 Brzeska was a loyal and loving cat, who will be missed by all those who were close to him, very, very much. RIP Brzeska Puss. This is beautiful! What a very sad loss – I must go an cuddle my cat. Very much sorrow for you but a cats life are some short and some longer… But so much love in a cat as you describe!!! So sorry to hear about your cat has pass away – Rip to him. As I have three old ladycats here at my home I hope you will get some new petfriend there you are – Lots of love and hugs from me!! Our other cat, moon, died a few days after Brzeska, we think of a broken heart. Now, we have our eyes on a little kitten here in mwanza. P.S I love the name pumpkin for a cat by the way. He did. Loved right to the end! I remember the lovely Brzeska (puss, not artist) very well – he was gorgeous and a real character. At least you have the comfort of knowing that he was well cared for from the moment you rescued him until he went to the great cat basket in the sky. Hope all is well there – I love reading your posts. The Hibiscus Thieves is beautiful – words and pictures. The title reminds me of something Michael Ondaatje should have written!